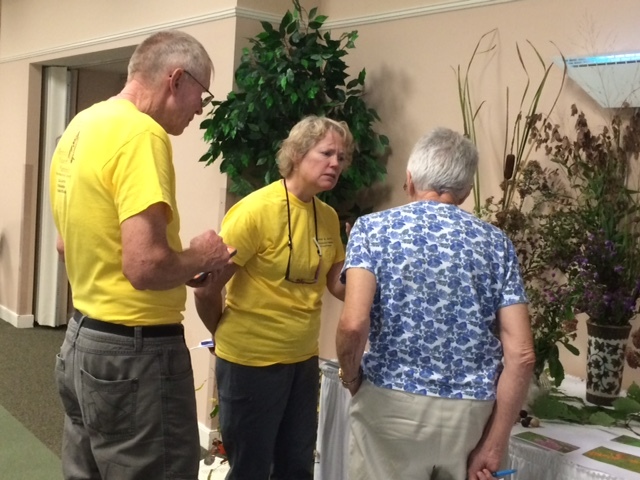 Byron and Elaine hosting the Native Wildflowers table for Nature in a Nutshell. On Tuesday, October 13 the cohort of 2015 held its culminating skills activity, “Nature in a Nutshell” at Bridgewater Retirement Community (BRC). Headwaters Master Naturalist members, trainees and residents at BRC considered the event a big success. Trainees had worked as a group to develop, organize and implement an afternoon activity for the residents at BRC. Class members combined personal interests and talents together with recently learned HMN skills to offer a fun afternoon of nature exploration and interaction. A few short days after the event, the trainees reviewed its successes and areas that might have been improved upon. The group agreed that flexibility and communication as a team played an important role in the process. While we may have “advertised” a bit more and increased the number of attendees, the small group and one-on-one interactions were seen as very rewarding. Ginny and Brian were praised for their sense of fun in wearing life jackets as they shared information about local flood events. What a great reminder to not take ourselves too seriously! Cohort 2015 thanks all of our supporting naturalists and our class leader, RoxAnna Theiss for helping with the event. Brian and Ginny listen as a BRC resident shares flood memories. Elaine at the Native Wildflowers table. October 25, 2015 in Projects, Training.